The forbidden fruit of the biblical Garden of Eden has taken on so much significance throughout the centuries that almost all cultures have a wide variety of expressions and sayings that deal with apples. 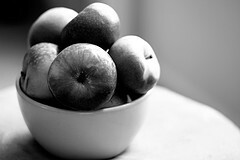 Apple idioms may also suggest the opposite – that something is amiss or smells foul. The French will say, “Il suffit d’une pomme pourrie pour gâter tout le tas” (“One rotten apple is enough to spoil the whole pile”) and the Spanish refer to “la manzana podrida” – the rotten apple. It is also interesting to note the unusual etymological diversity encompassed in this little word: The German word for apple (Apfel) differs from the French (pomme), which differs from the Italian (mela), which, in turn, differs from the Spanish (manzana). It is quite uncommon for a term so old to have come from such varied Proto-Indo European roots, and rarer still for it to remain this way in modern usage. The reason for the differences stems from the source of each word: Both the German and English utilize the ab-/ap-/af-/av- prefix for apples and apple trees of the early Celtic tongues (as does the Russian jabloko and Polish jablko). The French pomme stems from the Latin pomum, which originally referred to all fruit. However, pomum entered Latin only after the adoption of Christianity into the Roman Empire; before the 4th century, the word malum, Greek for “melon”, was also used to mean “apple.” For this reason, Italian still uses a derivation of malum to mean “apple.” The Spanish manzana also has Roman roots, but of a different nature. The term comes from an Iberian pronunciation of the Latin matianum, a word referring to a sweet-smelling golden apple that Matius, a friend of Caesar’s, raised. Did you know that the word manzana, if said in a spanish accent (i.e manthana), it sounds a lot like the ancient greek word μανθάνω (manthano)? μανθάνω means learn. Apple, tree of knowledge, learn… Too many coincidences, don’t you think? So apple tree “Manzano” would be understood be a Greek as “I learn” and the apple, fruit of the tree that proclaims to learn IS the fruit of knowledge.